When a person in another country seeks to invest in the Houston area with a business enterprise that will employ people here, he may have both temporary visa and permanent residence options available to him. Investors are some of the few people who can "self-sponsor." While most people seeking visas are required to be sponsored by an employer or family member, an investor may seek one without another person sponsoring. If you are seeking to come to the Houston area because you are investing a significant amount of money in a business here, you may seek to file an EB-5 petition or a petition for an E-2 nonimmigrant visa. A skilled Houston investor visa lawyer can help you identify what you need to do, and help you navigate through the complicated U.S. immigration system. Kathryn Karam helps is an attorney who finds creative solutions to complicated issues. Call Karam Immigration Law today at (832) 582-0620 to schedule a consultation to discuss your options. Karam Immigration Law assists those currently in or seeking to come to the Greater Houston area, including Spring, The Woodlands, Baytown, League City, Pearland, Sugar Land, Katy and Cypress. A person in another country investing significant capital in the United States may apply for a temporary visa to allow him/her to enter the United States as an investor seeking to direct and develop a business for a temporary period. People in this situation can seek an E-2 nonimmigrant visa. To obtain an E-2 visa, the person must be a national of a country with which the United States has a treaty. People with these visas, therefore, are often called "treaty investors." An employee of an E-2 investor may also qualify for one of these visas if he or she is of the same nationality as the investor and is serving in a managerial role or as a key employee of the company. A foreign national seeking to come live in the United States for employment on a permanent basis must obtain permanent residence in the United States. This is often called a "green card." As a permanent resident, he or she may work, move about the country, come in and out of the United States and have rights and privileges that temporary visa holders do not. He or she may also apply for naturalization to become a citizen. Employment-based petitions for permanent residence are divided into categories, called "preference categories." Four of these categories require employer sponsorship, and are based on the applicant's skill and the job he or she is expected to fill. The fifth, the EB-5 preference group, is based solely on the investment the applicant is making and the jobs that the investment will create. Invest at least $1 million of capital or $500,000 if in a rural area or a Targeted Employment Area (TEA, an area that has 150 percent of the national unemployment rate). An investor may employ his or her family members, but they will not be counted toward the 10-job requirement. The permanent resident status granted on the basis of an approved EB-5 petition is conditional and is valid for two years. Before the expiration of the two years, the investor must file a second petition to show that the enterprise in which he/she invested is still operational and the job creation anticipated from the investment has occurred or will occur in a reasonable period of time. If the investments are not made or an insufficient number of jobs are created in two years, the conditional residence is terminated and the individual is referred to immigration court. A person does not have to be an entrepreneur seeking to open his own business to obtain an EB-5 visa. People seeking investor visas may also invest their funds into one of several economic entities in the United States called "regional centers." Regional centers are entities that raise capital from foreign investors and then fund or loan projects that create jobs in the area. The regional center may be selective about the investors who may participate. When applying for a visa after investing in a regional center, the applicant may use a broader definition of jobs created, so that "indirect" jobs are included. Indirect jobs are jobs that created collaterally as a result of the project, as opposed to employees who are on the project's payroll. There are more than 40 regional centers in Texas, including many in the Houston area. If you are seeking an investor visa, a dedicated attorney can assist you. 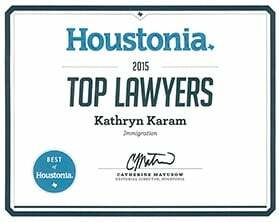 Kathryn Karam is an experienced Houston immigration lawyer who can assist you if you are seeking to obtain permanent residence based on the EB-5 immigrant investor program or an E-2 nonimmigrant visa. She can help you overcome any hurdles you may face. Call Karam Immigration Law today at (832) 582-0620 to set up a consultation.